The namespace for all of the interfaces and objects associated with handling databases. A simple data transfer object that describes a record from the BaseStation database for an aircraft. An extension of the BaseStationAircraft object that includes a count of flights. An object that holds the content of a record from the DBHistory table in the BaseStation database. A class that holds information from a single record in the DBInfo table of the BaseStation database. A simple data transfer object that describes a record in the BaseStation database for a sighting of an aircraft. A class that holds the information held within a single record in the Locations table in the BaseStation database. A class holding information from a single record from the Session table. A class that carries the information from a single record in the SystemEvents table from the BaseStation database. A record in the log database that holds information about an IP address that has been used to connect to the program. A record from the log database that describes a single session from an IP address. An object that carries search criteria for use in searching the BaseStation database. All string criteria are case insensitive. The interface for singleton objects that hold an instance of IBaseStationDatabase and automatically update its configuration when appropriate. The interface for objects that can deal with the BaseStation database file for us. 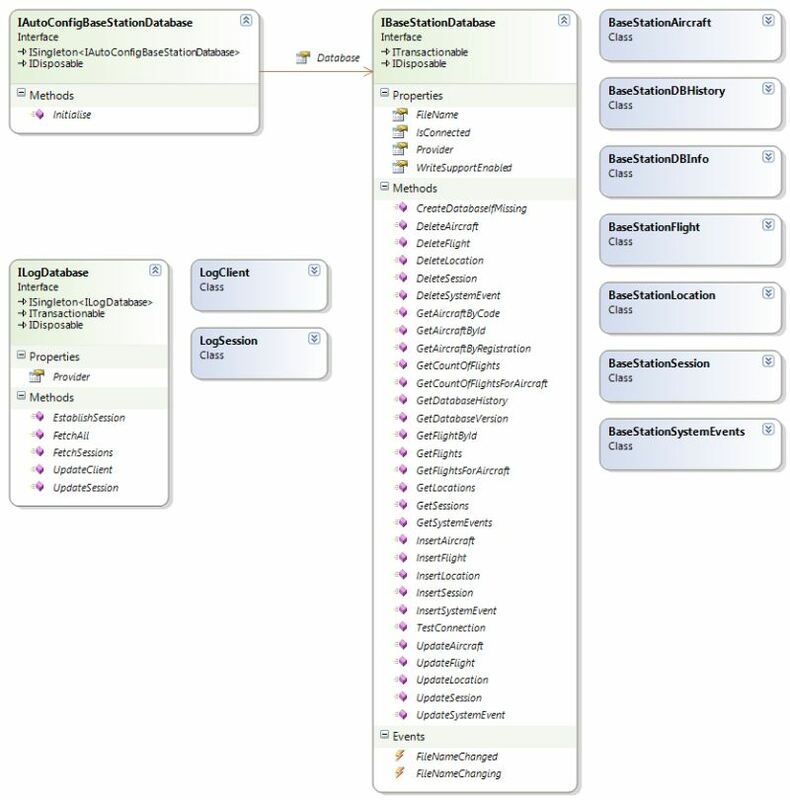 The interface for objects that abstract away the environment for the IBaseStationDatabase implementations. The interface to the log database. The interface for providers for the ILogDatabase implementations that abstract away the environment for tests. The interface that should be implemented by database objects that support transactions. The namespace contains classes for dealing with two databases - the BaseStation database of aircraft and flights (see IBaseStationDatabase and IAutoConfigBaseStationDatabase) and the database that Virtual Radar Server maintains of connection information (see ILogDatabase).